The objective of the research was to compile information and guidance to help drinking water utilities better understand (1) the basics of animal feeding operations and related agricultural activities, (2) the characteristics and quantity of the wastes produced, (3) the fate and transport of these contaminants in the environment, (4) potential contaminant impacts on source water quality, (5) and strategies that water utilities and CAFOs may use to control and monitor the release of these contaminants to drinking water sources. Concentrated animal feeding operations (CAFOs) for beef cattle, dairy cattle, swine, poultry, and other species are located throughout the United States to meet the demand for meat and other animal-related products. The growing trend toward concentrating increasing numbers of animals into smaller areas has magnified waste handling difficulties and increased the potential for releases of manure, excess animal feed, or by-products into the environment. Drinking water source quality may be adversely affected by contaminants originating from these facilities. Water utilities are encouraged to identify the location and characteristics of CAFOs and other smaller animal feeding operations (AFOs) in their source water areas, determine if these facilities pose a risk to source water quality, develop a prioritized plan of action for addressing key issues, and implement the components of the protection plan. 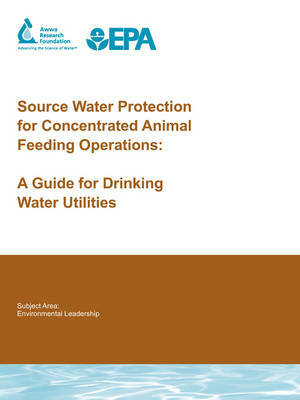 This research provides background information and guidance to help utilities assess potential impacts of AFOs and CAFOs on their source water quality, and for developing appropriate, successful, and affordable courses of action in cases where AFO and CAFO wastes are considered to be of concern.